We live in an age where you can learn a lot about almost any given industry for free online. Take digital marketing for instance. If you were interested in learning about the industry, you could learn a ton about it online from free resources like eBooks, videos, webinars, blog posts and podcasts. While the former examples are more common, the latter is still, in my opinion, an underrated form of content. If you still haven’t jumped into listening to podcasts, now might be the time. They can offer a ton of valuable information in a fun way. Here are 13 of the best marketing podcasts that you should definitely add to your queue today. The #AskGaryVee Show is hosted by the legendary Gary Vaynerchuck, an entrepreneur who took his family’s wine business from $3M to $60M in five years. He currently runs VaynerMedia, a successful “social media first” digital agency. On the #AskGaryVee show, Gary answers listener’s questions about marketing, social media, and entrepreneurship. There are currently 226 episodes and all are FREE! There is also an accompanying YouTube channel if you want to watch the sessions. ConversionCast is all about metrics. Each episode provides “real-life case studies from marketers who are already deep in the marketing trenches.” These marketers share a tactic they’ve used to increase their numbers and the hard data of the before and after results. This podcast is hosted by Tim Paige, the Conversion Educator at LeadPages, who has helped the company generate over 100,000 new leads and 30,000 paying customers. The Duct Tape Marketing podcast is hosted by small business marketing expert John Jantsch, author of the books Duct Tape Marketing, The Referral Engine, and The Commitment Engine. This podcast includes “interviews with authors, experts and thought leaders sharing business marketing tips, tactics, and resources.” John started the podcast late last year and publishes a new one each week, all for free! Entrepreneur on Fire, hosted by John Lee Dumas, is “a top ranked business podcast where I interview today’s most inspiring Entrepreneurs 7 days a week.” EOFire has won the Best of iTunes award based on its commitment to guide its listeners on their entrepreneurial journeys. Every podcast covers the guest entrepreneur’s biggest failure and lessons learned, his or her “Ah-ha” moment and the steps they took to turn it around, and a lightning round where s/he must answer six rapid-fire questions. Listen to learn about marketing, productivity, self-employment advice, work-life balance, growing an audience and other business essentials. This podcast is hosted by four members of the Fizzle team, including the CEO, Creative Director, the Head of Growth and the Head of Member Success. How Much Should You Promote Your Own Content? The Growth Show is HubSpot’s business podcast for “leaders consumed with driving growth—growing a company, growing a movement, growing an idea, growing a team.” Each episode features someone who has achieved remarkable growth and dives into how s/he did it. This podcast has various hosts (Kipp Bodnar, the CMO of HubSpot being one) and guests, including WildFire’s founder and the man behind PostSecret. The guys started back in 2013 and have continuously put out at least two free podcasts per month! Marketing Over Coffee is a podcast that covers both classic and new marketing. It covers topics including social networking, SEO, email marketing, copywriting, and offline marketing. Hosts include John J. Wall, VP of Marketing at EventHero, and Christopher S. Penn, co-founder of the PodCamp New Media Community unConference. The 15 episodes run from 17 to 38 minutes and have garnered four and a half stars on iTunes. The Smart Passive Income Podcast is hosted by Pat Flynn, a successful online entrepreneur who teaches people how to earn passive income online. The podcast includes strategy, weekly interviews, and advice for building your own online business. It has been featured on iTunes and in the New York Times, and has won awards from the Academy of Podcasters, New Media Europe, and PodcastAwards.com. The Social Media Marketing Podcast is hosted by Michael Stelzner, CEO and founder of the Social Media Examiner. Listen to this podcast to help your business “navigate the social jungle.” It includes expert interviews and success stories from leading social media marketing pros. You’ll also “discover how successful businesses employ social media, learn new strategies and tactics, and gain actionable tips to improve your social media marketing.” This is a free weekly podcast with over 150 episodes! The Social Pros Podcast, brought to you by Convince & Convert, was recently named the best podcast at the Content Marketing Awards. 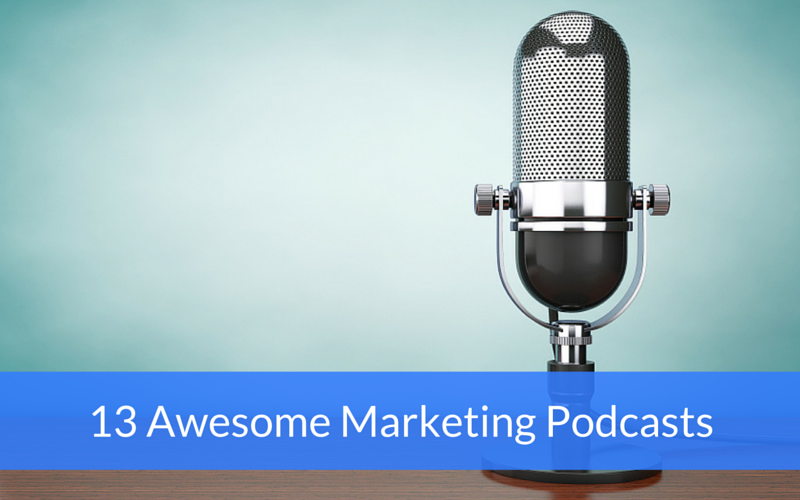 The podcast is hosted by Jay Baer of Convince & Convert and Adam Brown of Salesforce. This Week in Google covers the latest Google and cloud computing news. The show is hosted by Leo Laporte, founder and owner of the TWiT Netcast Network, and Jeff Jarvis, author of “What Would Google Do?” and creator and founding editor of Entertainment Weekly. This podcast boasts over 350 episodes and also includes videos. What are your favorite marketing podcasts? Please list them for us in the comments!